LH Lift Oy is proud to announce that we are continuing our sponsorship agreement with Finnish cross-country skier and Disabled Athlete of the Year Inkki Inola! 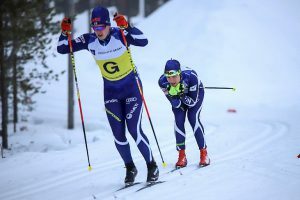 The highlights of the 2018-2019 season came in the sprint at the Östersund 2019 World Para Nordic Skiing World Cup in Sweden in January, where he claimed 6th in the sprint and 8th in the 18K, and the Prince George 2019 World Para Nordic Skiing Championships in Canada mid-February, where he claimed 9th position in the 20K despite suffering from an illness. In addition to skiing at the World Cup level, Inkki is continuing his law studies at the University of Eastern Finland in Joensuu. Everyone at LH Lift is extremely proud of Inkki’s success and is keen to continue supporting him over the next season.